Entrance fee to any monuments/National Park or camera fee. Morning after breakfast, drive to Corbett National Park (approx. 230Kms / 05 hours). Jim Corbett National Park is located in the state of Uttarakhand. The national park lies in the foothills of the Himalayas. Corbett Tiger reserve covers an area of about 1318.54 sq. km. including 520 sq. km. of core area and 797.72 sq. km. of buffer area. The core area forms the Jim Corbett National Park while the buffer contains reserve forests (496.54 sq.km.) as well as the Sonanadi Wildlife Sanctuary (301.18 sq.km.). It is a haven for Tigers as well as its prey, which include four kinds of Deer, Wild Boar and some lesser-known animals. Leopards are mostly found in the hilly areas of the Corbett Park. Some nocturnal cats found here are the Leopard Cat, Jungle Cat and Fishing Cat. Sloth Bear is found in the lower regions of the park while the Himalayan Black Bear is seen in the higher hills only. The Dole or Wild Dog, though they can be seen in the southern areas of the park along with the Jackal. Some of the smaller residents of the park are Himalayan Palm Civet, Indian Gray Mongoose, Common Otter, Black Naped Hare and Porcupine. Elephants are among one of the main attractions of Jim Corbett Park. Along the Ramganga River shores, one can spot the long-snouted, fish-eating Gharial Crocodile and the 'Mugger' Crocodile. Upon arrival check-in at the hotel and relax amidst the comforts of your room. Overnight at the hotel. Morning and afternoon safari through the national park. Evening is free for relaxation and individual activities. Overnight at the hotel. Early morning safari through the national park. Return to the hotel for breakfast and drive to Fort Uchangaon (approx. 175Kms / 04 hours). Upon arrival check-in at the hotel and relax amidst the comforts of your room. Overnight at the hotel. Morning after breakfast, drive to Agra (approx. 180Kms / 04 hours). Upon arrival in Agra, we check-in at the hotel. Afternoon visit Agra Fort, where Shah Jehan, in the later years of his life, was imprisoned by his son to prevent him from spending the family fortunes on a black echo of the Taj Mahal. Later visit one of the best known wonders of the world, the Taj Mahal. Built by Shah Jehan as a mausoleum for his favorite wife, Mumtaz Mahal, the Taj is built of white marble, beautifully carved and inlaid with semi-precious stones. Overnight at the hotel. Morning after breakfast, drive to Jaipur (approx. 255Kms / 06 hours) en-route visit to Fatehpur Sikri, and the beautiful capital built in 1640 by the Mughal King, Akbar the Great. The city was later abandoned for lack of water. A superb example of Mughal architecture, it stands perfectly preserved in the desert. Continue your drive to Jaipur. This historic city was founded by Maharaja Swai Jai Singh in 1727 AD after shifting his capital from Amer valley to newly formed and planned city of its time after consulting so many maps of the world and finally organized own religious map Shilpa Shastra with the help of a young Bengali architect Vidyadhar Batacharya. Maharaja Swai Jai Singh was a builder, astronomer, astrologer, soldier, philospher. Presently, Jaipur is the capital of Rajasthan and is world famous as the Pink City. Upon arrival at Jaipur, check - in at the hotel. Evening is free to relaxation or independently explores the crowded and colorful lanes of the pink city’s local bazaars. Overnight at the hotel. Morning after breakfast, drive to Ranthambore National Park (approx. 165Kms / 04 hours). It former hunting ground of the Maharajas of Jaipur, the Ranthambore National Park is situated in Eastern Rajasthan at the confluence of the Aravali hill ranges and the Vindhyan plateau. The rugged terrain and the dense deciduous forests are major features of this national park, which has among the largest and most diverse collection of wildlife species in India. Upon arrival, check - in at the hotel. Evening is free to relaxation. Overnight at the hotel. Morning and afternoon Jeep/Canter safari to view wildlife. Main species found Tiger, panther, hyena, jungle cat, civet, sambar, chital, nilgai, bear, wild boar, green pigeon, red spurfowl etc. Overnight at the hotel. Morning and afternoon Jeep/Canter safari to view wildlife. Evening is free for individual activities or relaxation. Overnight at the hotel. Early morning safari through the national park. Return to the hotel for breakfast. Rest of the day is free for individual activities or relaxation. In evening transfer to the railway station to board train for Katni. Overnight on the board. In the morning arrive at Katni Railway station and drive to Bandhavgarh National Park (approx. 95Kms / 02 hours). 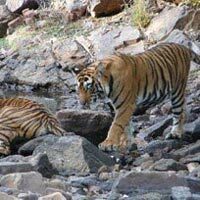 Bandhavgarh National Park is spread at vindhya hills in Madhya Pradesh. It consists of a core area of 105 sq. kms and a buffer area of approximately 400 sq. kms of topography varies between steep ridges, undulating, forest and open meadows. It is known for the Royal Bengal Tigers and former hunting preserve of the Maharaja of Rewa and at present is a famous natural hub for White Tigers. White Tigers, now a major attraction around the world's zoos, were first discovered in Rewa, not far from here. The terrain is broken, with rocky hill ranges, running roughly east west, interspersed with grassy swamps and forested valleys. Bandhavgarh National Park is one of the finest national park in the India and has the distinction of harboring the highest concentration of tigers per unit area of forest. Upon arrival, check - in at the hotel. Afternoon Jeep/Canter safari to view wildlife. Overnight at the hotel. Morning after breakfast, drive to Kanha National Park (approx. 225Kms / 05 hours). Kanha National Park has Kanha's sal and bamboo forests, rolling grasslands and meandering streams stretch over 940 sq. kms in dramatic natural splendor. This is original Kipling country of which he wrote so vividly in his Jungle Book. The same abundance of wildlife species exists today in Kanha National Park, which forms the core of the Kanha Tiger Reserve created in 1974 under Project Tiger. 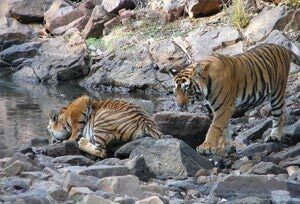 Depletion of the tiger population in the years that followed led to the area being made an absolute sanctuary in 1952. By a special statute in 1955, Kanha National Park came into being. Since then, a series of stringent conservation programmes for the protection of the park's flora and fauna has given Kanha its deserved reputation for being one of the finest and best administered National Parks in Asia, an irresistible attraction for all wildlife lovers and a true haven for its animal and avian population. Upon arrival check-in at the hotel and relax amidst the comforts of your room. Evening is free for individual activities or relaxation. Overnight at the hotel. Morning after breakfast, drive directly to Nagpur airport (approx. 250Kms / 05 hours) to board flight for Kolkata. Upon arrival check-in at the hotel and relax amidst the comforts of your room. Overnight at the hotel. Morning after breakfast, start sightseeing tour of Kolkata which includes visit to Victoria Memorial - Built of white marble and surrounded by lush gardens, the Victoria Memorial is probably the most beautiful monumental legacy of British India. It was built by Lord Curzon in the early 20th century in memory of the late Queen of England. St. Paul's Cathedral. The Birla Planetariums - This single-storied, circular structure is one of the largest planetariums in the world. The central hall is air-conditioned and can accommodate up to five hundred persons. Also visit Indian Museum, Eden Gardens - These gardens were created in 1840. A Burmese-style pagoda brought after the British victory in the Burmese war of 1884 is set at a lake and Kali Temple. This temple is dedicated to Kali, the patron goddess of Kolkata. Kali means "black". Kali is the destructive side of Lord Shiva's consort, Parvati. The present temple was built in 1809 on the site of a much older temple. Overnight stay at hotel. Morning after breakfast, transfer to the airport to board the flight for Guwahati. Upon arrival, drive to Kaziranga National Park (approx. 195Kms / 05 hours). Kaziranga national park which is mainly famous for Indian one Horned Rhinoceros. Located on the banks of the mighty Brahmaputra River in the far North East of India, Assam, with covering an area of approximately 430-sq-kms, with its swamps and tall thickets of elephant grass, making Kaziranga National Park the ideal habitat for the Indian One-Horned Rhino. Due to limitless poaching of this prehistoric survivor, the Kaziranga National Park was declared a wildlife sanctuary in 1940. Upon arrival check-in at the resort/ Camp and relax amidst the comforts of your room. Afternoon Jeep safari to the National park for wildlife viewing and also visit the tea gardens and rubber plantations. Overnight at the resort/ Camp. Today will awake a little early with a wake call, half an hour before we will head for our morning elephant safari (05:30 am to 06:30 am) to the national park for wildlife viewing. Return back to resort/Camp for breakfast. After breakfast jeep safari (either central or western range). Return to camp for lunch and later go on a jeep safari to the national park (if visited central range in the morning then western range or vice versa). Overnight at the resort/ Camp. Apart from the great one horned Indian Rhino, the other major wild attractions include a large population of Indian Elephants, Indian Bison, Swamp Deer or Barasingha, Hog Deer, Sloth Bears, Tigers, Leopard Cats, Jungle Cats, Otters, Hog Badgers, Capped Langurs, Hoolock Gibbons, Wild Boar, Jackal, Wild Buffalo, Pythons, Monitor Lizards, etc. Overnight at the resort/ Camp. Today after breakfast, continue with our wild safari with kaziranga on the consecutive day to explore the more wildlife. We will be doing the jungle safari as per the very previous day. We will enter twice to the national park visiting either central or western range first. Overnight at the resort/ Camp. Morning after breakfast, drive to Nameri National Park (approx. 90Kms / 02 hours). Nameri national Park covering an area of 200 Sq. Kms nestled at the foothills of Eastern Himalayas. It is famous for the high density of elephant population. Nameri National Park covers an area of 200 Sq. Kms. With river Jia Bhoroli bifurcating the park, it is the most scenic of all the national parks of Assam. It’s in the eastern border of Assam in the valley and mountainous Arunachal Pradesh, Nameri is home to some of the endangered species like white winged wood duck, Sloth Bear, Tiger Leopard, Clouded Leopard, Sambar, Gaur, Indian Wild Dog, four varieties of Hornbill and many other winged species. The other reason Nameri is famous for, is the herds of elephants. The park have a high density of elephant population and due to lessening of forest cover, they sometimes invade human inhabited villages, which have attracted the attention of wildlife conservationists worldwide. Upon arrival check-in at the camp and relax amidst the comforts of your room. Evening is free for leisure walks around the camp site or individual activities. Stay overnight at the Camp. Morning after breakfast a guided trekking through Forest reserve to explore its major wildlife. Afternoon enjoy river rafting. Evening is free to for leisure walks around the camp site or individual activities. Overnight at the Camp. Morning after breakfast, drive to Guwahati (approx. 210Kms / 05 hours). Upon arrival check-in at the hotel and relax amidst the comforts of your room. Afternoon is free for individual activities or relaxations. Overnight at the hotel. Morning after breakfast, transfer to the airport to board the flight for Kolkata/Delhi. Upon arrival, rest of the day is free to explore the city or for individual activities.